When people noticed that two dogs had been living under an abandoned school in their neighborhood for several months, they decided to call for help — and had no idea at the time just how many lives they would be saving. 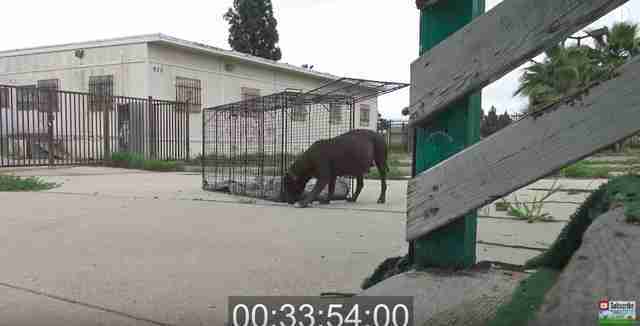 Hope for Paws, a rescue based in Los Angeles, received a call about the homeless dogs and drove over to the abandoned school to see if it could locate them. Rescuers found an opening in the building, and before long, a sweet pit bull was sticking her head out, cautiously greeting them. … the pit bull was very pregnant. It suddenly became even more imperative that both dogs be rescued that day, as it wasn’t only their lives that were at stake, but the lives of their future puppies. Using the food they had brought along, the rescuers began to lure the dogs away from their hiding spot and over to the rescuers’ car. The dogs followed cautiously, driven by their hunger and their obvious love for each other. 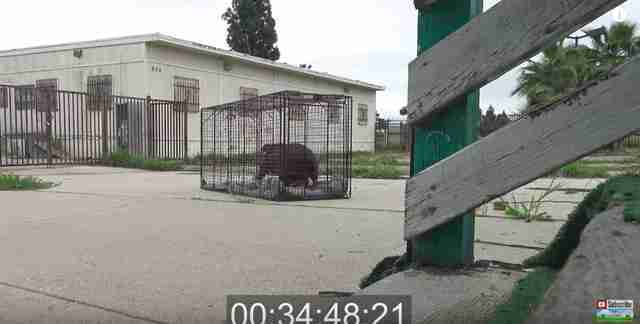 The rescuers set up a trap and placed some food inside, and before long, the German shepherd was safely in the trap. Unfortunately, seeing her friend suddenly trapped startled the poor future mama pit bull, and she slowly began to back away and headed back to her initial hiding spot under the school. Determined to rescue her and her babies, the group prepared a second trap right near the entrance to the hiding spot, then hid as well as they could and waited. … and went inside, causing the door to fall shut behind her. It had just started to rain, and rescuers were so thankful that the sweet pup had decided to enter the cage just in time. 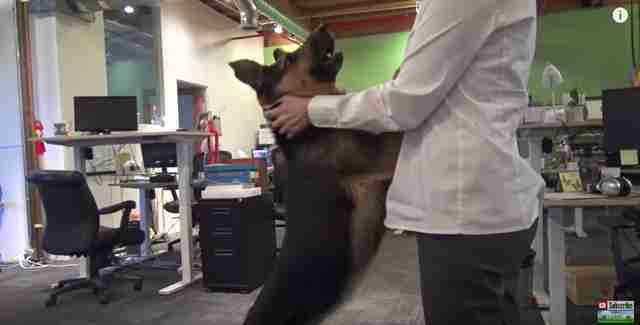 As they loaded both dogs into their car, rescuers saw some local police officers driving by. The officers said they had seen these dogs wandering around the area for months, and were so excited that someone had finally managed to rescue them. The rescuers decided to name the pit bull Tooney and the German shepherd Sully. They drove the pair to a local vet to get checked out, and both were very nervous when they first arrived. Once they were out of their cages and back together, though, both began to relax, and seemed very happy to be off of the streets and finally safe. Not long after being rescued, Tooney gave birth to nine sweet, healthy little pit bull/German shepherd mix puppies. Both mom and her puppies are doing extremely well, and are now looking to find their loving forever homes. Lucky Sully has already been adopted, and is loving every moment of his new life. If you’re interested in adopting Tooney or one of her nine puppies, you can contact Doggie Bonez for more information.